The indieGS2K measures only 40 x 40 x 100 mm, weighs just 170g and operates stand-alone without the need of a control-box. It incorporates a high-grade 2/3 inch CMOS global-shutter sensor and delivers up to 60 frames of 2k footage in 12 bit RAW. The modular design and a selection of durable and compact accessories make the indieGS2K the perfect tool for every shot that demands the highest possible image quality, minimal weight and tight dimensions. In addition, the indieGS2K enables you to shoot the roughest action footage free from rolling shutter issues. It is also perfectly suited for multi-camera applications and elaborate 360° VR-Rigs. The highest image quality is obtained by recording CinemaDNG files on the Odyssey 7Q+ recorder. The data can be ingested directly from the SSDs and CinemaDNG files perfectly integrate into most post-production workflows. For broadcast applications the indieGS2K teams up with the indieMORPHO, a broadcast CCU, paint-box, and advanced image processor. This tiny box converts the indieGS2Ks native RAW-over-HDSDI signal to pristine uncompresses YUV 4:2:2 3G HDSDI. This unique feature set and the smooth integration of indieGS2K CinemaDNG footage into almost any post-production workflow makes it a versatile tool for feature film, high-end broadcast production, live coverage, and commercials. The camera has a C-mount and miniPL lens mount with adjustable back-focus that allows you to choose from the wide range of high-resolution lenses. Adaptors for B4-mount are also available. Since it offers Genlock Sync input through a second BNC connector, the indieGS2K is especially well suited for 360° VR, 3D, and other multi-camera applications. Large arrays of cameras can easily be daisy-chained and simultaneously configured via one single remote connection. 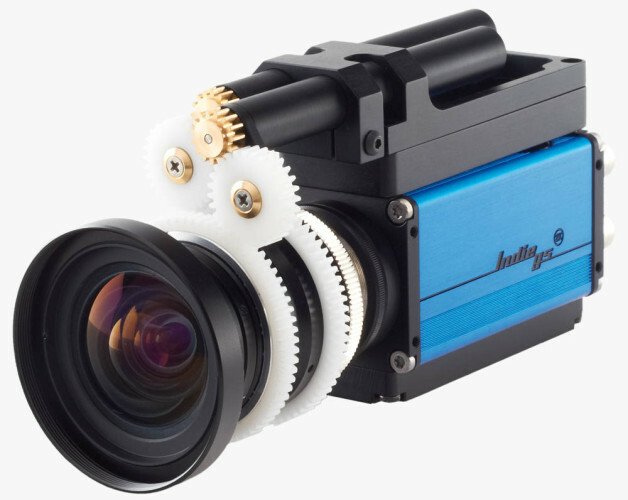 Equipped with the indieIFC motor system focus and iris can be precisely operated with wireless follow-focus controllers like the cmotion cvolution. then be fed into your post-production pipeline.